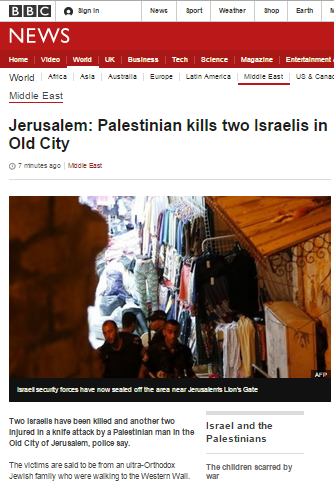 The BBC’s coverage of Israel’s violence in Jerusalem didn’t meet with its approval. 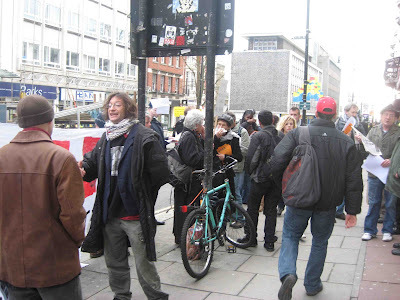 The shooting of Palestinians took precedence over the killing of settlers. 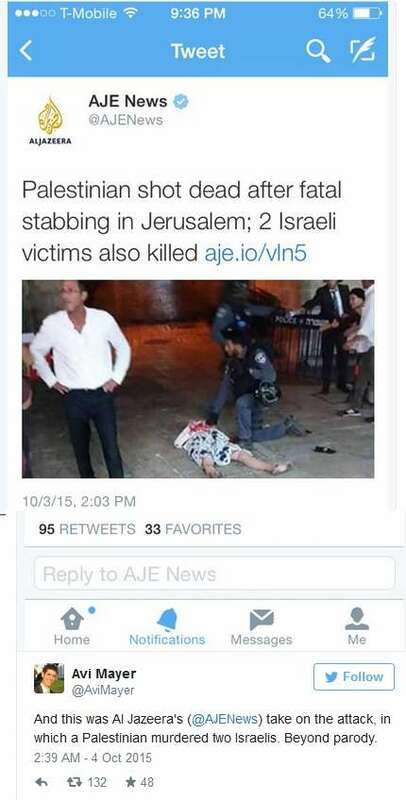 So the Israeli state didn’t just complain, like you and me, it demanded that the headline on the story be changed. 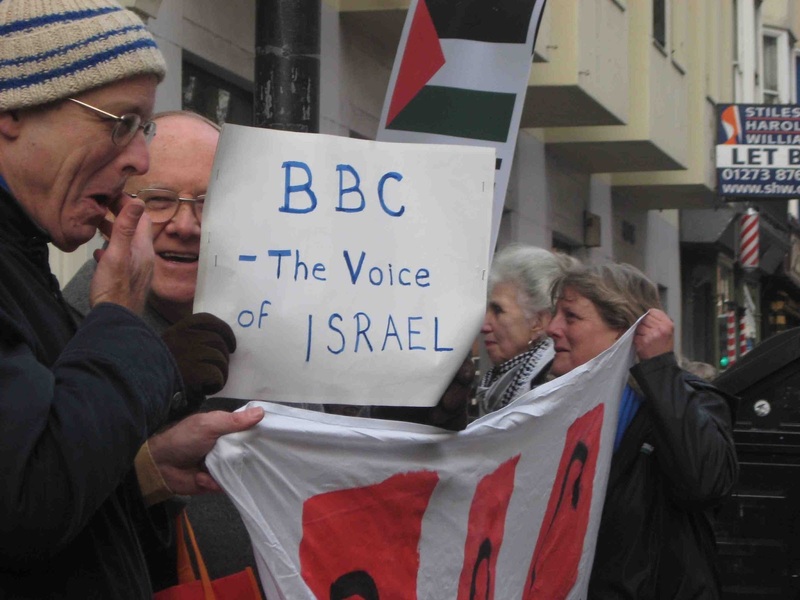 And so ‘a harshly-worded letter’ was sent to Richard Palmer, head of the BBC’s bureau in Israel. Like any good police state, sorry ‘the only democracy in the Middle East’ warning that ‘it could face sanctions for running a news headline highlighting the death of the Palestinian terrorist shot by police’. 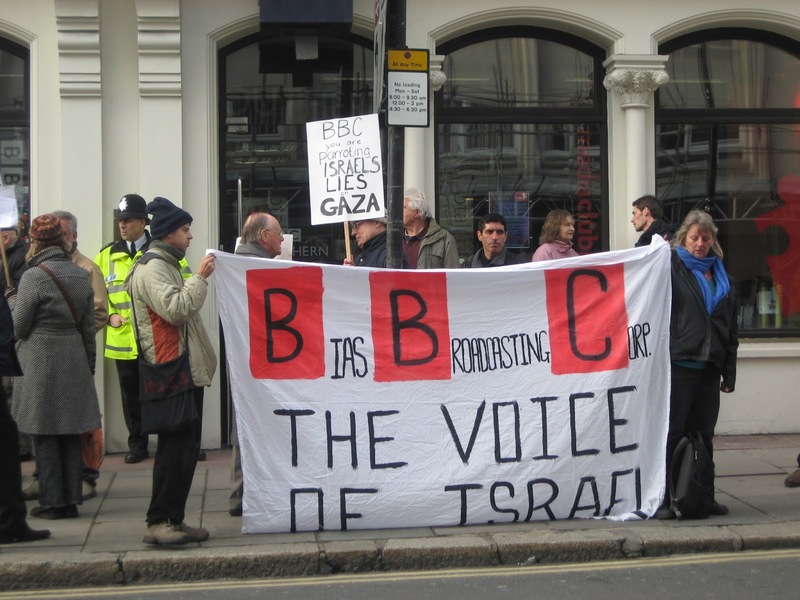 In Israel it is a normal democratic practice for the government to place sanctions on those whose coverage is deemed unacceptable. Naturally the BBC jumped to obey. 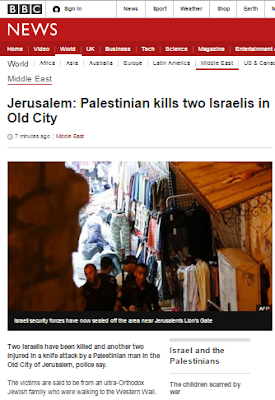 Nitzan Hen, head of the Government Press Office, told Palmer that the BBC’s efforts were “far from satisfactory.” The headline was changed at least three times, but each time to a phrase that ‘did not accurately reflect the events’. 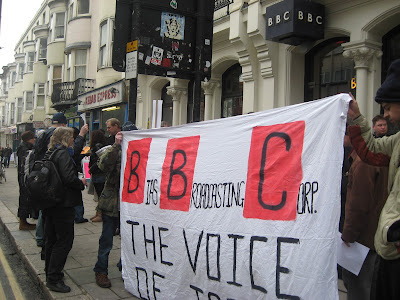 And now you see just how the BBC, that robust defender of press freedom behaves in practice. 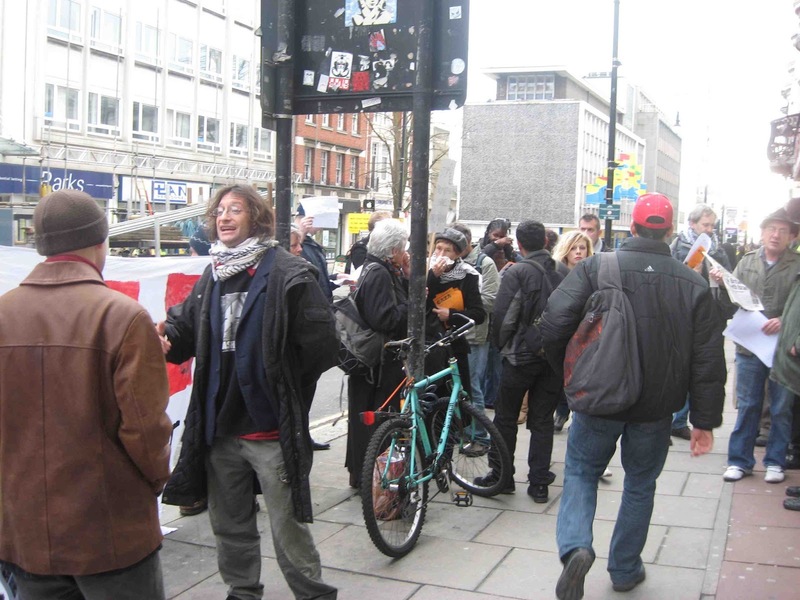 Now if this was Mugabe’s Zimbabwe…. Note how in the crazy Zionist world of Israel the BBC ‘has a long history of alleged anti-Israel bias’. News to some of us, that’s for sure. 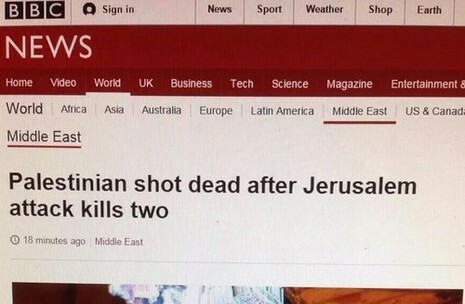 The Government Press Office on Sunday warned the BBC it could face sanctions for running a news headline highlighting the death of the Palestinian terrorist shot by police Saturday after fatally stabbing two Israelis, rather than the attack itself. The headline, which referred to the two Israeli victims in a passive voice and neglected to mention that the Palestinian casualty — Muhannad Halabi, 19 — was shot by police at the scene of the deadly attack, was widely condemned in Israel. Hen charged that the BBC coverage of the Israeli-Palestinian conflict was “unethical” and could serve to incite more violence against Israelis. 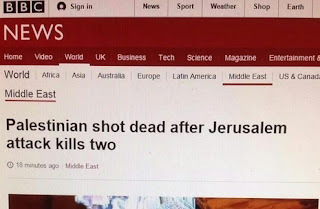 Officials in both the GPO and the Israeli Embassy in London asked the network to change the headline and it was changed at least three times, but each time to a phrase that did not accurately reflect the events of Saturday’s attack, the Hebrew language NRG website reported. 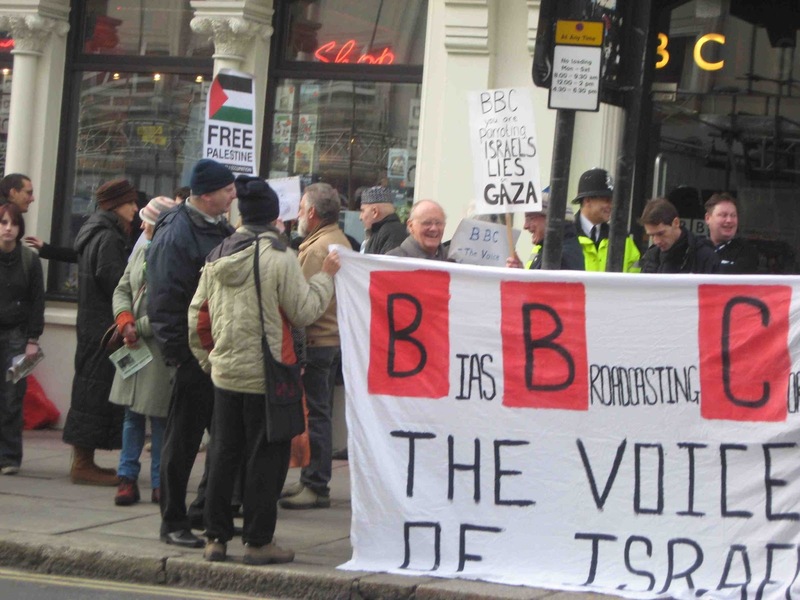 The network, which has a long history of alleged anti-Israel bias, claimed in its defense that the headline in question was written by a junior editor and was not the result of an anti-Israel agenda. According to a GPO official, Israel expects an official apology from the network, and said the office was considering annulling the press cards of BBC journalists, a decision that if implemented would not allow the network to continue operating in Israel. The news agency called the criticism by its viewers “valid” and said the story was updated with the amended headline. 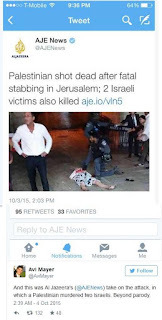 In their reports, neither al-Jazeera nor the BBC referred to the deadly stabbing attack as terrorism. On Saturday evening, Rabbi Nehemia Lavi and IDF soldier Aharon Banita were stabbed to death in Jerusalem’s Old City by Halabi. Banita’s wife was also stabbed and was taken to hospital in serious condition. The Banitas’ two-year-old was lightly wounded in the attack. Police announced Sunday it would limit Palestinian access to Jerusalem’s Old City and the Temple Mount compound over the next two days.